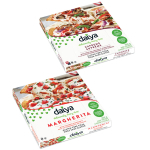 Daiya Dairy-Free Frozen Pizzas are free of everything except flavor. 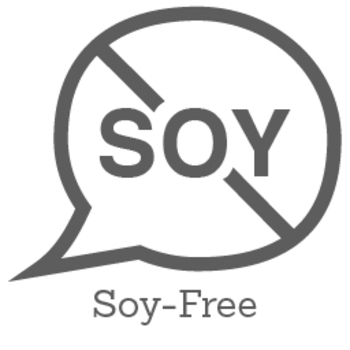 They’re dairy-free, soy-free, gluten-free and full of deliciousness. Try all 6 delicious flavours: Cheeze Lover’s, Supreme, Margherita, Fire-Roasted Vegetable, Mushroom & Garlic, Spinach & Mushroom. 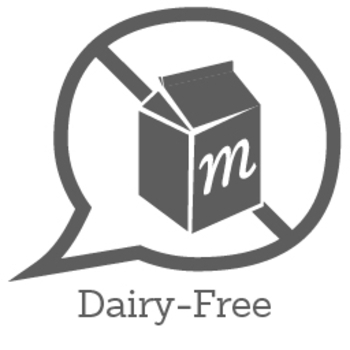 Founded in 2008, Daiya Foods is the leader and creator of deliciously dairy- free products that melt, taste and stretch like dairy-based cheese. 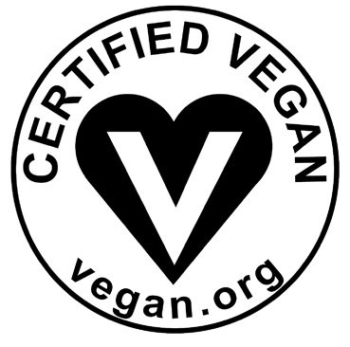 Whether you suffer from allergies, are dairy-intolerant, living vegan or simply choosing a healthier lifestyle, Daiya’s plant-based alternatives are the perfect choice. Cheeze Lover's Pizza: Gluten-free crust (Water, Tapioca starch, Brown rice flour, White whole grain sorghum flour, Potato starch, Olive oil, Cane sugar, Milled flax seed, Yeast, Psyllium, Sea salt, Xanthan gum), Tomato basil sauce (Water, Tomato paste, Olive oil, Onions, Basil, Salt, Garlic, Xanthan gum, Spices), Daiya mild mozzarella and cheddar style shreds blend (Filtered water, Tapioca starch, Non-GMO expeller pressed canola and/or non-gmo expeller pressed safflower oil, Coconut oil, Pea protein isolate, Inactive yeast, Salt, Vegan natural flavors, Vegetable glycerin, Xanthan gum, Lactic acid [vegan], Titanium dioxide [a naturally occurring mineral], Yeast extract, Citric acid, Annatto [for color]). Margherita Pizza: Gluten-free crust (Water, Tapioca starch, Brown rice flour, White whole grain sorghum flour, Potato starch, Olive oil, Cane sugar, Milled flax seed, Yeast, Psyllium, Sea salt, Xanthan gum), Tomato basil sauce (Water, Tomato paste, Olive oil, Onions, Basil, Salt, Garlic, Xanthan gum, Spices) Daiya mild mozzarella style shred (Filtered water, Tapioca starch, Non-gmo expeller pressed canola and/or non-GMO expeller pressed safflower oil, Coconut oil, Pea protein isolate, Salt, Inactive yeast, Vegan natural flavours, Vegetable glycerin, Xanthan gum, Lactic acid [vegan], Titanium dioxide [a naturally occurring mineral], Yeast extract), Tomato, Basil. Supreme Pizza: Gluten-free crust (Water, Tapioca starch, Brown rice flour, White whole grain sorghum flour, Potato starch, Olive oil, Cane sugar, Milled flax seed, Yeast, Psyllium, Sea salt, Xanthan gum), Tomato basil sauce (Water, Tomato paste, Olive oil, Onions, Basil, Salt, Garlic, Xanthan gum, Spices) Daiya mild mozzarella style shred (Filtered water, Tapioca starch, Non-gmo expeller pressed canola and/or non-GMO expeller pressed safflower oil, Coconut oil, Pea protein isolate, Salt, Inactive yeast, Vegan natural flavours, Vegetable glycerin, Xanthan gum, Lactic acid [vegan], Titanium dioxide [a naturally occurring mineral], Yeast extract), Beyond Meat Italian Sausage- style Crumbles (Water, Pea protein isolate, Non -GMO expeller-pressed canola oil, Natural flavors, Garlic, Spices, calcium, Sulfate, Paprika, Potassium bicarbonate, Caramel color, Yeast extract, Salt, Onion), Crimini mushrooms, Green bell pepper, Red bell pepper, Red onion. Spinach & Mushroom Pizza: Gluten-free crust (Water, Tapioca starch, Brown rice flour, White whole grain sorghum flour, Potato starch, Olive oil, Cane sugar, Milled flax seed, Yeast, Psyllium, Sea salt, Xanthan gum), White sauce (Water, White navy bean and/or fava bean flour, Non-gmo expeller pressed safflower oil, Garlic, Sea salt, lactic acid [vegan], Yeast extract, Black pepper, Guar gum, Xanthan gum), Daiya mild mozzarella style shred (Filtered water, Tapioca starch, Non-gmo expeller pressed canola and/or non-GMO expeller pressed safflower oil, Coconut oil, Pea protein isolate, Salt, Inactive yeast, Vegan natural flavours, Vegetable glycerin, Xanthan gum, Lactic acid [vegan], Titanium dioxide [a naturally occurring mineral], Yeast extract), Crimini mushrooms, Spinach, Roasted garlic. Fire-Roasted Vegetable Pizza: Gluten-free crust (Water, Tapioca starch, Brown rice flour, White whole grain sorghum flour, Potato starch, Olive oil, Cane sugar, Milled flax seed, Yeast, Psyllium, Sea salt, Xanthan gum), Tomato basil sauce (Water, Tomato paste, Olive oil, Onions, Basil, Salt, Garlic, Xanthan gum, Spices) Daiya mild mozzarella style shred (Filtered water, Tapioca starch, Non-gmo expeller pressed canola and/or non-GMO expeller pressed safflower oil, Coconut oil, Pea protein isolate, Salt, Inactive yeast, Vegan natural flavours, Vegetable glycerin, Xanthan gum, Lactic acid [vegan], Titanium dioxide [a naturally occurring mineral], Yeast extract), Roasted red onion, Roasted green bell pepper, Roasted yellow bell pepper, Roasted tomato, Roasted garlic, Basil. Mushroom & Roasted Garlic Pizza: Gluten-free crust (Water, Tapioca starch, Brown rice flour, White whole grain sorghum flour, Potato starch, Olive oil, Cane sugar, Milled flax seed, Yeast, Psyllium, Sea salt, Xanthan gum), Tomato basil sauce (Water, Tomato paste, Olive oil, Onions, Basil, Salt, Garlic, Xanthan gum, Spices), Daiya mild mozzarella and cheddar style shreds blend (Filtered water, Tapioca starch, Non-GMO expeller pressed canola and/or non-gmo expeller pressed safflower oil, Coconut oil, Pea protein isolate, Inactive yeast, Salt, Vegan natural flavours, Vegetable glycerin, Xanthan gum, Lactic acid [vegan], Titanium dioxide [a naturally occurring mineral], Yeast extract, Citric acid, Annatto [for colour]), Shiitake and Crimini mushrooms, Roasted garlic. 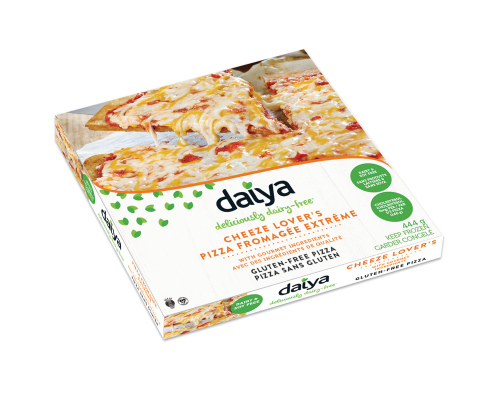 i like that daiya are dairy free which is hard to find. the ingredients are also simple which makes it special. 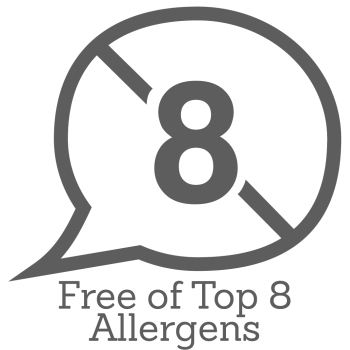 i would recommend it to people with dairy and other allergies. I was surprised how tasty it was. Very glad to be able to eat pizza and not get sick! Some of my friends have since tried and love it too!!! I didn't think it would taste like it did. 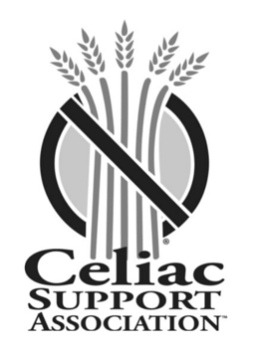 My son is allergic to dairy so I have been trying to find something that works for him. I can't say it's his favourite but it was still good enough for him to have 2 slices. This product was okay. I prefer dairy but thought I’d try something different as I had a friend come by who is lactose intolerant and thought it would be something they would enjoy.